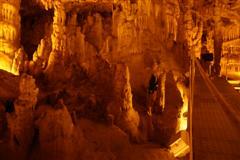 There are over 3000 caves on Crete but only some are open to the public. At about 25km from the Bella Casita, on the way to Heraklion you will get to the exit to Melidoni. From the exit, a short drive will take you into the mountains and to the village of Melidoni. The cave can be found at 2km past the village on the hillside. The view from the taverna next to the cave is amazing. Many archeological items have been discovered in the cave over the years. Most of them are at display in the Museum of Rethymnon. 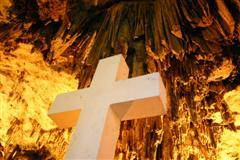 The cave was the place of an tragic event during the Turkish occupantion in 1820. 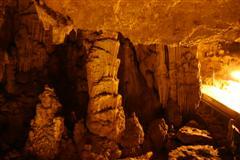 During the occupation, local people used the cave for refuge. When the Turkish came to the area, the refugees refused to surrender. In response the Turkish placed a big fire at the entrance to the cave and everybody inside died from the lack of oxygen. 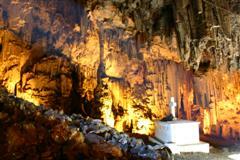 A tomb has been placed in the cave to commemorate the events that took place there. In more ancient times, the cave was the mythical home of Talos, the giant bronze protector of Crete. The legend says that Medea, the sorceress, stole his protective thorn, and Talos bled to death.